What is ABR/OAE? ABR (Auditory Brainstem Response) as well as OAE (Oto-Acoustic Emission) are specialized hearing tests that can evaluate whether a child/infant/newborn can hear without requiring them to respond. These tests are completely non-invasive. Just like an EKG measures a heart's electrical activity using little stickers, ABR/OAE testing checks out the electrical activity from the ear to the brain. Special stickers on the head enable us to "see" whether the brain "hears" any sounds introduced into the ear. If the ABR/OAE testing comes back normal, rest assured your child's hearing in both ears is normal. Specifically, OAE is performed by placing an earpiece and playing clicks into the ear. The machine than listens for an echo which indicates that the ear "heard" the clicks. ABR is performed just like an OAE, but special leads are placed behind the ear and forehead which measures brainwaves (just like an EEG or an EKG) to see if the brain "hear" the clicks produced by the testing machine. 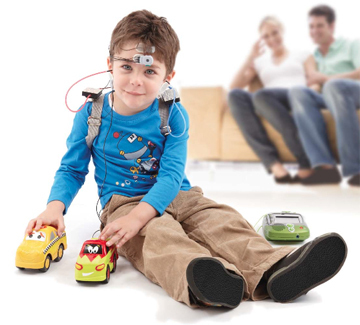 There are several different types of ABR (regular, tone burst, bone conduction, ASSR) depending on the age of testing and reason for the testing. Traditionally, ABR/OAE testing required sedation in order to obtain accurate and reliable results as any muscle activity can lead to false reports. Furthermore, there are a lot of wires going from the patient to the equipment and as such required the patient to stay still. In the case of infants/children, this mandated general anesthesia in a hospital operating room. Fortunately, new technology that our office possesses eliminates the need for such sedation and still obtain accurate ABR/OAE test results. Our office uses Vivosonic Integrity which incorporates wireless technology and the use of an in-situ bio-amplifier which amplifies biologic electrical activity at the ear source thereby reducing interference from environmental electric, magnetic, and RF field-induced noises. This also dramatically reduces artifacts which result from other muscular and ocular electrical activity. What does this all mean for a patient? It means that an ABR/OAE can be obtained in our office on a child/infant who is actively moving and playing around, eating food, chewing gum... all without being attached to wires. No sedation. No medications. No needles. No pain.